The reports from two women on the imetelstat clinical trial lay on my desk. They could have been reporting on different drugs. Within two months of starting the trial all my symptoms — fatigue, night sweats, itching and bone pain are gone. Dr. Tefferi told me there are no safety issues with long-term use of this drug…It’s beyond wonderful. The infusion routine every three weeks itself was a little taxing, requiring a flight in to the center the night before, a full day of labs, the three hour infusion process itself and exams…it’s a miracle drug. Going through the trial journal of a woman with ET, the story is different. The day after infusion I was OK but on the third day the story changed. I lost all appetite and had painful intestinal problems that lasted a last a couple of days. The good news is my hemoglobin remained above 8.5 and only required one transfusion for the whole year on imetelstat. Sleeplessness became a problem, mood changes, too. And then, after ten months on the trial, everything changed…15 minutes into the infusion “my pelvic area would be so painful I couldn’t stand it. … After the third time the doctor and I agreed I would not continue on the trial….There was another patient who also had to stop because she had severe liver problems. Why Dr. Tefferi reported that imetelstat had little or no side effects only he can answer. There were patients with serious side effects and that cannot be ignored or suppressed. Patients have to be aware that this medicine is not perfect It can help many but it is not perfect. Imetelstat may turn out to be the next blockbuster myelofibrosis drug or a total bust. Either way it’s an historic MPN research and development effort that just might turn things around. The main MPN event in next month’s ASH meeting is the presentation of findings in a small, very brief, single-site pilot study of this unlikely candidate. Imetelstat is a product of the labs of Geron Corporation, a Menlo Park-based company that has raised and dashed hopes for nearly two decades and recently reinvented itself. And imetelstat is a drug that failed in two major attempts in the recent past before regaining its footing. Now, with a realigned corporate vision and the help of an eminent and controversial hematologist, Geron and imetelstat may well be staging a successful comeback. Imetelstat targets the telomerase enzyme that stimulates growth of telomeres. Every chromosome in every human cell comes with multiple copies of a repeated TTAGGG DNA code that essentially signals the chromosome’s boundary . 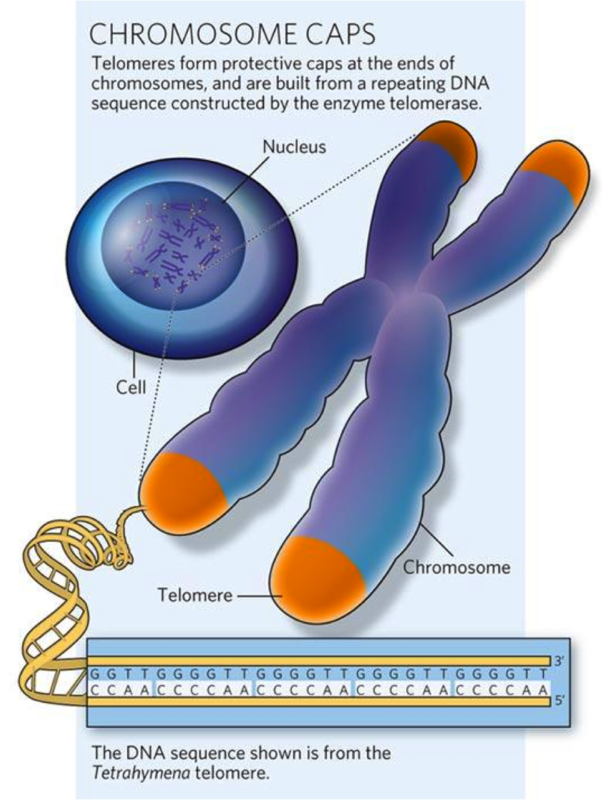 Telomeres are the repetitive code at the ends of chromosomes. The main function of telomeres is to preserve the integrity of the chromosome, avoid fusion, inappropriate combination. They’re often compared to shoelace tips. Telomeres are also, in a sense, the ticking clock of most normal cells. They grow smaller — less code — each time most cells divide. until a certain minimum size is reached and the cell can no longer divide and dies. Telomerase is an enzyme that supports the survival of the telomere. In the presence of telomerase, telomeres maintain or elongate their structure and protect the dividing cell. Genes code for proteins, that is they contain the code that makes something that does something. In this case, the TERT (human Telomerase Reverse Transcriptase [hTERT] ) gene encodes for the protein telomerase. We’ll get back to TERT but for now, consider telomerase. It’s an enzyme that acts as a catalyst for a metabolic process. And the process it helps move along is survival of the telomere. So, in simplest terms, if there’s a cancer cell you want to destroy you would deprive its telomeres of telomerase and eventually it would die as the telomeres used up their supply of code and were unable to replenish it. The ideal target for such an attack would be leukemic cells functioning with relatively short telomeres, cells that depend on a telomerase rich environment. Some cells, like stem cells in the bone marrow, continue to divide during our entire lives, a function made possible by the presence of telomerase. But malignant cells can also flourish when supplied with telomerase. It’s estimated up to 80-90% of human cancer cells express the TERT gene and associated proteins and the resulting telomerase storm prevents the cell from dying. Instead of the normal aging process these cells just keep on proliferating causing MPNs or, in other cancers, solid tumors. In a sense, like blood to a vampire, the telomerase enzyme confers a kind of immortality on cancer cells. Inhibiting its action would put a wooden stake in the heart of the cancer cell. Theoretically. A trial that changed everything. Imetelstat wasn’t effective when Geron tried it on breast cancer or another solid tumors, non-small cell lung cancer. But blood, a liquid medium, appears to be a more likely environment. After getting reportedly promising initial results in a phase I essential thrombocythemia/polycythemia vera trial that opened in November 2010, the Menlo Park company began the process that would lead it to ASH next month. 100% response as in everyone. While “efficacy data” for the two PV patients participating in the early trial was not reported, data from the initial 14 continuing ET patients was presented at ASH in Dec. 2012. Those results were updated in June. 2013 by principal investigator Dr. Gabriela M. Baerlocher of the University of Bern, Switzerland at the European Hematology Association conference with data from an additional six months of treatment for the original group of 14 plus four additional patients. All patients, however, demonstrated some liver function test abnormalities.The majority were mild with occasional grade 2-3 elevations in ALT or AST. These were reversible by decreasing dose. With Tefferi’s MF research cohort barely accrued, Geron scheduled an 8:30 AM conference call in April of this year to announce first quarter 2013 results… and a radical change in the corporation’s development strategy. Staff was stripped down from 64 to 44 positions and the internal discovery research program and research lab facility were terminated. Geron, announced Dr. John Scarlett, president and CEO, planned “to focus resources on hematologic malignancies.” Essential thrombocythemia, however, was not to be included in that focus. 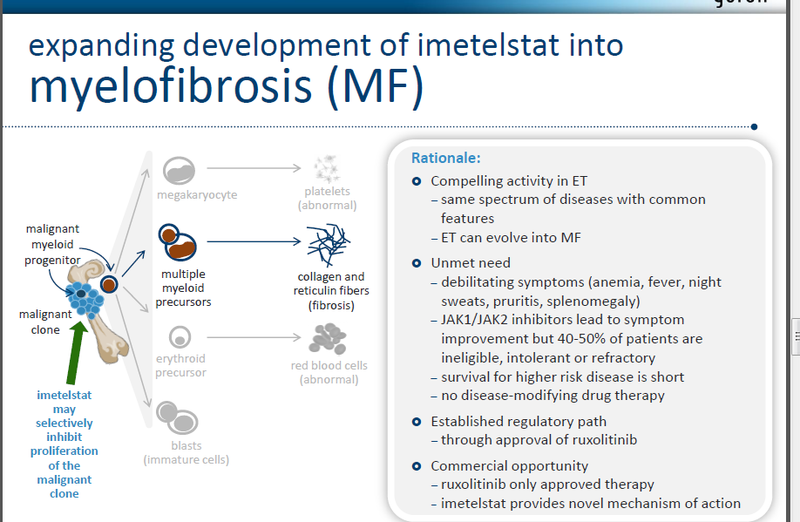 Geron ended clinical development of imetelstat in ET to focus its resources on the MF market. In the crosshairs of Geron’s development plan was the myelofibrosis market dominated by Incyte’s JAK-2 inhibitor, Jakafi. 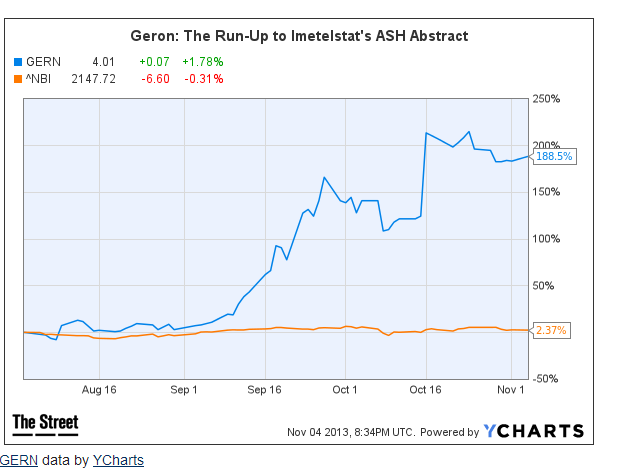 Geron was betting the farm on imetelstat’s successful challenge to JAK2 inhibitors in the myelofibrosis space. It was a bold strategic move and, given the unproven efficacy of imetelstat, the long testing and approval process ahead and the deeply entrenched position of competition, a long shot. Quick steps on the way to ASH. Shortly before Baerlocher at the EHA meeting in June announced strong results in the now discontinued imetelstat ET trials, Geron initiated an April 26 Conference Call with investors and media. CEO Scarlett indicated promising findings in the MF study from comments he got from Tefferi. November 7, after a massive swelling of interest (and stock-price), Tefferi’s formal ASH abstract was published on-line. The Tefferi Pilot Study in one sentence. The official purpose of the Tefferi pilot study was to “See how well Imetelstat sodium (GRN163L) works to relieve primary or secondary myelofibrosis symptoms. Before publication of the preliminary results, fueled by controlled information leaks and overheated media responses to reports of Complete Response and recovery of the bone marrow, the Geron stock more than doubled in price and MPN social media buzzed with talk of remission and cure. The actual reported results are somewhat less dramatic. There were a total of 33 patients enrolled in the study. Results from the first 18 patients – followed for a minimum of 3 months — are the subject of the published abstract. Two patients were discontinued, one because of “unrelated death” and the other because of disease progression. Four patients were reported to have demonstrated Complete Response (bone marrow and peripheral blood), two Partial Response and three patients showed Clinical Improvement. The problem with the data. The biggest issue of course is the research question hasn’t yet been answered. Prominent in both the abstract and in media reports are the claims of Complete Response and Partial Response. A few reporters protested that characterization of response as Complete or Partial required clinical or symptomatic responses according to the often disputed and contentious International Working Group criteria. But so far as the stock market and MF patients were concerned this was an unimportant technicality. The abstract report narrowly confined its target results to bone marrow and blood, presumably because hard data supported those claims. An argument could be made that resolution of fibrosis in the marrow and return to normal cellularity would be reflected in resolution of spleen and liver swelling and other MF symptoms. Maybe. We should know more during the oral presentation of findings at ASH, December 9, at 4:45 PM in the Convention Center’s New Orleans Theatre. In any case it’s unlikely that Tefferi, the author of the Revised response criteria for MF from the International Working Group and European Leuikemia Net would have been unaware of the criteria. More significantly, two adverse events that occurred in the earlier imetelstat ET trial were thrombocytopenia (low platelets) and elevated liver enzymes. Imetelstat’s successful lowering of platelet levels in ET may well be a formidable obstacle to its use in myelofibrosis where thrombocytopenia is often a dose-limiting issue. The data on adverse events in the abstract is sparse. 33 patients were in the trial. The abstract reported on treatment results of the first 18 .Two discontinued, one from unrelated death, the other because of disease progression. Thrombocytopenia (low platelets) was a problem in over 25%. We can’t know with so small a cohort treated over so brief a time what the long-term effects of telomerase inhibition will be, whether in fact the effect can be limited to the hematopoietic system or might impact other systems. Only multi-site formal clinical trial can give us the answers now. A courageous — or desperate — corporate commitment has been made and solid clinical investigation work has done to get imetelstat to this point. Clearly the next steps require money – one estimate is $100 million for openers – and the steady application of solid testing and development. The need for capital can sink imetelstat if it leads to hyping of product to boost share prices and anything less than rigorous clinical trial design. Biggest question is will science trump marketing or is imetelstat to go down as another oversold boondoggle. What happens next, whether focus on celebrity or science, will come from the playbook of P.T. Barnum or Sir Isaac Newton. First indications are the circus has come to town. Clinical trial indications were presented to media before publication of data. Biotech trade media headlined stories promising important developments and highlighting “Complete Response,”and the stock market, ever eager to pounce on emerging opportunities, bid up Geron’s price over 150% in just a day or two on these advance rumors from a small and promising but inconclusive pilot study. The most important takeaway however is this: Imetelstat might actually work and based on preliminary findings deserves a clean shot. Before massive investment pours in and further buries the science in a mountain of money, marketing and media hype, we can only hope a solid strategic plan guides the next steps. As MPN patients and caregivers all we can do is take a deep breath and wait with cautious optimism. While looking ahead at Jakafi charging through the MF patient population, Geron product managers should also look over their shoulders at a well-established drug that has a legitimate claim on its telomerase turf: the interferons. In the case of imetelstat, we can only hope there will be a cooling off period after this over-heated run up to ASH. The Big Top carnival atmosphere, with trombones, marching band, and somersaulting clowns juggling premature conclusions before the amazed eyes of spectators is counterproductive. We just don’t know how good this drug is but the data presented so far gives us cause to hope it will prove effective. Which, for myelofibrosis, is a lot more than anything else on the table this season. © MPNforum.com and MPNforum Magazine, LLC, 2013. Unauthorized use and/or duplication of this material without express and written permission is prohibited. Excerpts and links may be used, provided that full and clear credit is given to MPNforum.com with appropriate and specific direction to the original content. Any updates on your stance? A Janssen continuation decision on whether or not to continue imetelstat development is due by the end of the month. Although the investment boards are lit up as Geron fans bid up its stock in anticipation of a further Janssen investment, we’re concerned with the basic science and its translation into clinical applications. More specifically we have followed imetelstat in a narrow hematologic application for which we witnessed the company make extraordinary and baseless claims in the past. We’ll be at the ASH meeting in San Diego and take the opportunity to explore current research findings if reported. If there is promising, substantiated news affecting myelofibrosis patients we will be happy to report it fully. This drug has major problems…use with extreme care…. What do you make of the recent reports and clinical progress for Imetelstat, J&J’s strategy here, further head count reduction at GERN, and course for Phase III in 2017? We’ve always been ambivalent about Geron and Imetelstat, doubtful of efficacy, concerned over toxicity and unwanted effects, and hopeful the telomerase approach might prove successful. Since J&J pulled out of the low dose trial arm for lack of efficacy, the med has fallen off our radar. (The high dose med you’ll recall resulted in the FDA placing a partial hold on clinical trial.) Despite the steady optimistic drumbeat of Geron investors, the steep price decline to a current share evaluation of around $2.suggests this ambivalence, at least, is widely shared. The telomerase inhibitor imetelstat in patients (pts) with intermediate-2 or high-risk myelofibrosis (MF) previously treated with Janus kinase (JAK) inhibitor: A phase 2, randomized study. Sorry, Nick, we’re going to have to sit this phase out until some hard news and clinical trial data emerge. It won’t be immediate. Please inform us if the MPN Forum accepts any donations, or financial aid from the Geron Company or INCY. Of the two patients you quoted, I have the link to the first, who I believe to be Joann and John’s blog on the web. I don’t have the link to the second “ET” patient’s blog. Can you provide this link? I am a little confused, as the prior ET trial was done in Europe by a Swiss doctor. Dr. Tefferi to my knowledge was not involved in any ET trial with GRN163L, but he is doing the MF phase 1 trial using GRN163L. Are you saying that ET patient(s) are in Dr. Tefferi’s MF trial? A link to the second patient’s blog will help to clarify the confusion. Unfortunately, it is hard for small biotech’s to raise funds to develop new drugs in this tough economy after the 2008 Great Recession crash. Even before 2008, Geron had difficulty raising funds, as it was also developing ESC (embryonic stem cells) treatments, which the Republican religious right waged a war against, so that big pharma’s were scared to partner with Geron, because they were afraid of political and religious attacks. For example, a big pharma partner of Geron, Roch withdrew from Geron’s board around 2003 after the Bush administration started its campaign against ESC. A coincidence? Maybe yes, maybe no. 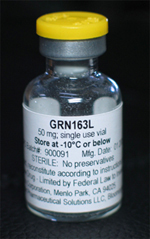 Around 2005, big pharma Merck became a partner of Geron to develop a new version of a telomerase cancer vaccine, but soon after Merck was hit the VIOXX lawsuit. A coincidence? Maybe no, maybe yes. Since the lawsuit, Merck has disengaged from Geron by not picking up an option to develop a more advanced version of telomerase cancer vaccine. While stock investors may be effected negatively by the politics, it is the cancer patients who are hurt most from the lack of funding to develop these new technologies. Because the politicians have made a hostile economic environment for Geron, which has to divest itself of its ESC development arm, as one of the aim of getting the politicians off of its back, so as to make it easier for any big pharma to partner with it without having to look over its shoulder. Geron has been in a political circus, which you claim it is fund raising circus, for years. 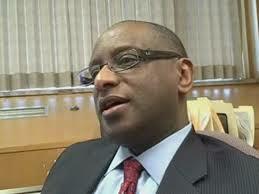 Geron has also wasted money like buying GRN1005 for 90M cash plus a lot of dilutive stocks. It is not easy to develop new cancer drugs, and it is expensive and time consuming to deal with the FDA trials. At the end of the day, stock investors may lose some money, but cancer patients will lose their lives, when development funds are hard to get, and new treatment developments are delayed, abandoned, and not improved upon from lack of funds. Recently I have come more familiar with the Adam F you mention in this article. This political science major has taken every opportunity to second guess Geron and is a paid stock basher. His consideration as any type of respected science analyst is an absolute joke. On Dec 9th, when Geron held an important conference call to discuss the ASH abstract, this so called analyst was to busy taking care of a wounded dog and taking his kids to fencing class than to listen to the conference call. However the next morning, he was back to slamming Geron. The tone of your article sounds much like him. Is their an update to your story now that the ASH abstract has been released? Hello, Justin. Clearly you have strong feelings about both Geron and a writer from another publication. Please note our Comments policy forbids personal attack. Please try to confine your comments to issues of fact or opinion expressed in MPNforum articles. At ASH, I had interviews with investigators, the chief Geron medical officer, reviewed the abstract and slides and am scheduled to review Dr. Tefferi’s taped, transcribed presentation tomorrow. And, in my opinion, anyone who would choose to attend a webcast corporate press event rather than tend to his wounded dog is a heartless fool who should be reported to animal control after being horsewhipped. Right to the point, as always, Zhen! Here is the latest press release from Mayo Clinic for Tefferi’s presentation December 9th: http://www.mayoclinic.org/news2013-rst/7808.html — 22 patients for more than 6 months on the trial and the data holds. As Zhen put it: It might just work. Thanks, Robert. That’s a press release– embargoed, by the way until December 9 — that contains claims, not data. Of course this drug might work and open new therapeutic possibilities but preliminary claims from a small, single site, investigator sponsored pilot study is still only “promising.” Love the promise…but there’s a lot of work and time ahead if that promise can be realized. We might learn more Monday evening at ASH. A superb article. No other publication currently covers this important drug as comprehensive and balanced as MPN forum. Hoping to seen an update from the ASH presentation next monday. Well this IS our MPN community hometown news and Zhen is the editor in chief and publisher. From what I understand from the “Editor’s Code of Practice” he is in full compliance and then some. His articles are always well researched and accurate. He gives (urges) all concerned an opportunity to reply. He doesn’t obtain any materials by subterfuge,and never pays criminals for info, Zhen gains no financial profit from his editorial duties and he makes no perjorative remarks re race, color religion, etc. …and he writes in the public interest. That’s us! I read the blog you are referring to, I think. As of one month ago the patient had normal HB, normal organs (no spleen) but still WBC of 50k. They were planning infusions twice weekly. We saw that and can’t confirm the story. The<a href="“> Geron Investor press release page — a place where a monster announcement like this would have to be found — has nothing and in light of the gamble Geron is making on this trial, this market and this drug it seems unlikely. Still, who would have anticipated the Sanofi events of last week. If you hear anything please pass it along. Wow – seldom read such a well analyzed drug evaluation – Thanks! Very informative article, thank you. I sense you have a liitle ax to grind and it would have been better if it was not evident. Thanks for the comment, Ron. I’m not exactly sure what ax you feel we have to grind but you’re undoubtedly right about one aspect of that story. We try to be objective and fact check all elements of a story to skirt issues of bias. It’s not always possible to succeed. There are a few prevalent financial issues that muddy the waters and warrant exposure: Hyping drugs or services, inflating expectations to raise patient hopes (and stock prices), drug price gouging, conflicts of interest, etc. In the imetelstat story, we saw a company redefining itself, a drug and technology with promise, a published abstract that seemed to sidestep the central research question of the trial (Does it relieve MF symptoms?) while reporting very positive results along narrow parameters… and an explosive stock price increase. Detailing the technology, the gamble Geron is taking, Wall Street’s response, reporting patient and expert reactions, and assessing that ASH abstract all in 2500 words produced under deadline would inevitably short-change some part of the whole story. There will, hopefully, be time to present a fuller picture as trial data emerges and Geron’s clinical trial plans unfold. Meantime, do please continue to hold MPNforum to standards of journalism that promote full understanding without bias in our MPN community.